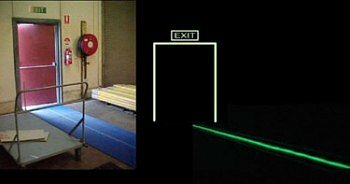 "WAY OUT" TUBE TREAD and SUPA GRIPPA "PATHFINDER" matting revolutionizes safety for workers by providing a superior glow-in-the-dark ribbon of light towards exit routes. For safe and quick evacuation of occupants in the event of an emergency power failure, this product provides unpowered, no-maintenance lighting. This world-first self-illuminating warp has been developed in conjunction with WAY OUT Evacuation Systems Pty Ltd, who are accredited defence, maritime, aeronautical, transportation and in building specialist suppliers of self-illuminating emergency assistance products and signage. We invite you to visit their website. Free of hazardous or radioactive substances.